HUFFMAN  Lakewood Heights residents are at last getting some work done on yellow drinking water and a broken sanitary sewer line from their provider, the City of Houston. The residents have been complaining of extremely bad City of Houston water for at least the last six months in the subdivision. Residents offer as proof pots and pans of collected water that have a yellow, metallic appearing residue once the water evaporated. Jack Ervin had met with former Mayor Lanier to come to an understanding of the needs of the crossover of Huffman East gate Rd. 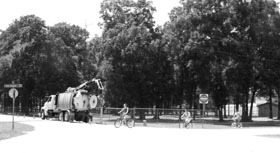 Sanitary Sewer Line to East Lake Houston Parkway schools. The school districts must interact with three distinct jurisdictions over roadway, the Texas Dept. of Transportation, Harris County and the City of Houston on various projects. Thats just it, there is a lack of planning and coordination in the Citys approach to working on projects that effects peoples lives. responded Wiseman to reporter inquiries into City of Houston priorities. The ruptured sanitary sewer line is a 13 inch main on Huffman-Eastgate that broke Nov. 3, Ervins written co-respondence did not receive a response until Feb. 10, stating that items on the list would be taken care of in 180 days. Ervin sees the time from Nov. 3 until July as a slow turn around. On Wednesday, July 23, the Public Works Director came out to work with residents and view local problems. CROSBY How bad does Crosby want a YMCA and what are they willing to do to get one. These are some of the questions that organizers hope to get a handle on when they hold a public meeting July 31. The Crosby-Huffman Chamber of Commerce is hosting the meeting at Newport Elementary beginning at 7 p.m. Despite the presence of youth programs at the Texas Sports Ranch, the Crosby Sports Association and a swimming pool in Newport, the chamber of commerces economic development committee has begun investigating the possibility of a YMCA in Crosby. Speaking at the meeting will be Doug Earle, vice president of operations for the YMCA. In June, Earle met with members of the economic development committee. At this, meeting he said that in order for Crosby to get a full-service facility, a number of actions must be taken. The first, he said, would be to charter a branch. The Houston Area YMCA would require Crosby to have an operating budget of $500,000, serve 2,000 people through their programs and have an ongoing support campaign which could contribute at least $25,000 annually to the local branch. To build a facility the YMCA would have to acquire about 15 acres of land and $5 million. Since this is not often feasible at the start, Earle said that it is more likely that Crosby could begin a satellite office, from which they could run their programs. Most of the things we can do without a building, although most communities want a building, said Earle. To operate a satellite office, Earle said that the community would have to provide at least $150,000 in program fees. Currently, those wishing to participate in YMCA programs have to go to either the Wendel D. Lay Branch in North Shore or the Baytown branch. Earle said that he didnt think a YMCA would have an adverse effect on existing youth programs in the community because their programs are less competitive and experience has shown that parents will supplement existing programs with the Ys programs rather than replace they outright. CROSBY  Completion of a three year project by Crosby Volunteer Fire Dept. and Rural Fire Pretection District #8 will result in lower insurance premiums for residents and business owners in Crosby and Barrett Station. Crosby VFD, in conjunction with RFPD #8, achieved the second best rural department ISO grade in the United States and also tied for the second largest one step drop in ISO classification in the country. The Insurance Service Office rates fire protection classification on a scale of 1 to 10 with 1 being best rating and 10 being worst. Using this rating classification, Crosby/Barrett Station was multi-rated 6, 9, 10. If a building was within 1000 feet of a fire hydrant maintained by one of the five water municipalities in the fire district, the building was rated an ISO Class 6. If the building was outside of that 1000 feet but within five driving miles of a fire station, it was rated as an ISO Class 9. If the structure was outside that five mile drive distance, it was rated as an ISO Class 10. Effective August 1, 2004, the entire fire district that encompasses the Crosby/Barrett Station area (approximately the same boundaries as Crosby ISD) will become an ISO Class 4. This translates into significant savings for residents and business owners on their insurance premiums. The departmental goal was originally a district wide ISO Class 5, but as we got further into the process, we realized that we had the potential to exceed that original goal and put forth the extra effort to achieve the Class 4. The following table of potential savings was pulled from the Texas Department of Insurance web page (www.tdi.state.tx.us/fixe/fmppcchanges.htinl). The table was summarized here to reflect the ratings relevant to Crosby and Barrett Station. Numbers shown in the table are not necessarily reflective of savings a resident can expect. Savings may depend upon the value of the home, the levels of coverage selected, deductibles, the specific insurance company the resident has, etc. While Im not an insurance professional, its my understanding that insurance companies arent required to re-evaluate a policy while its still in effect. Each policyholder should contact their agent to determine if they are eligible to realize the savings immediately or if they must wait until their policy renews. explains Assist. Chief Chris Black, the ISO Project Facilitator. A tremendous thanks to all firefighters who participated in the multiple timed trial evolutions while under the scrutiny of a video camera, repeated the necessary tasks again and again until we felt we couldnt do it any better, and didnt complain until after picking up the thousands of feet of large diameter hose that we have tested and laid out in various drills. added Black. BARRETT STATION Organizers of this years Barrett Station homecoming celebration say that this is one of the biggest and most well-attended events they have had in years. The celebration is designed to bring together friends, family and alumni from Charles Drew High School and Drew Intermediate School. While the homecoming reunion was on July 19, events actually started a week earlier with a kickoff celebration at the Shiloh Missionary Baptist Church. Willie Goodlow, president of the Barrett Station Civic League, said that since church plays such an important role in the Barrett community it was only natural that they should be included in a homecoming celebration. She praised the efforts of the Barrett Ministerial Alliance in helping with the effort and bringing parishioners of different denominations together to celebrate in unity. 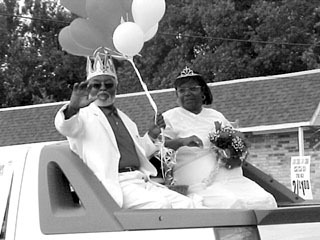 On July 15, the Fifth Annual Queen and the First Annual King contest was held at the Riley Chambers Community Center. This years senior queen is Evelyn Jacobs while Jquayla Paul was named the teen queen. Isaac Outlay was named the first ever king. In addition to this contest, several other groups held pageants as well, naming their own sweethearts. D.B. Jazzy Mike provided live entertainment the evening of July 18, as the community came together at Barrett Primary School for the Charles R. Drew Reunion Mix and Mingle. Activities continued the following morning with a parade down Crosby-Lynchburg Road. This years parade featured over 50 units including floats, pageant winners, Constable Ken Jones, a pair of motorcycle clubs, and an equestrian club. After the parade, the Fifth Annual Health Advisors Community Health Fair was held at the Chambers Center. This health fair featured a selection of health screenings from local doctors, the Brentwood Mobile Unit, and immunizations provided by the Baytown Health Center. The celebration came to a close Saturday night with a reunion at Barrett Primary. The keynote speaker for the night was Leon C. Anderson of Austin. Anderson, a poet and writer, told about his experiences growing up in Barrett Station and how he applied those lessons learned to his life outside of Harris County. CROSBY  The Texas legislature wont be leveling any new taxes to handle the shortfall of state funding for schools, instead, that burden is being shifted to property poor districts like our own. The Board of Education of Crosby ISD met Monday, July 21 and decided on a balanced budget for this next school year. The Board cut about $2.3 million dollars out of the operations budget and discarded12 positions. In spite of the funding shortfall, the board decided to make up about $500 per employee in insurance benefits. That is being given as an employee raise, seen as important to lower salaried personnel. According to Superintendent Don Hendrix, usually Crosby ISD hires about 34 new teachers a year, this year there will be only about 10 new teachers. Also, there are not a lot of teachers moving around to new locations, all school districts throughout Texas are reflecting a statewide recession. At teachers fair, where teachers meet with potential employers to seek job opportunities there are usually about 300 to 350 teachers seeking relocation, this year the numbers exceeded 1200. The Board decided rather than layoff personnel, positions will be shifted, reassigned to new jobs. Teachers that quit and went to new jobs will makeup the number of lost positions at Crosby ISD. Barbara Barrett, formerly Principal of Drew Intermediate School has been reassigned. According to Hendrix, she is being replaced by Mary Jenkins. Hendrix expressed his full confidence in Ms. Jenkins. The Crosby ISD Board checked with the attorney for Texas School Boards before making the move. Along with budget shortfalls, changes in personnel can add unexpected problems. Most of Crosby ISDs employees have their pay direct deposited into their bank accounts. That transfer of funds usually occurs close to the middle of the month. But instead of deposits being made on July 14, they werent made until July 17. The reason given is that an incorrect Federal income tax code had been entered for employees and the check deposits had to be stopped and a correction made. The usual personnel handling payables had become ill. According to Hendrix, in solving the problem, banking entities such as Compass Bank and Crosby State Bank cooperated with Crosby ISD in making the adjustment. A letter was sent to employees explaining the error related to the new tax table. Crosby ISD will have to absorb the expenses of overdraft if asked for reimbursement with proof of overdraft. This is the second time in 17 years that a similar incident has happened. Hendrix estimates the cost of the error will be Very little. but other sources estimated that the error could potentially cost nearly as much as a years salary for a new teacher. While it may seem unlikely that the cost of the error would run that high, one would have to question if the reassignment of personnel could increase the likelihood of errors for the schools. An employee with complete capability in one job might be less competent in another even similar job. It seems the school district is scrambling to stretch the school dollar just like all the other school districts in Texas. Harris County Attorney Mike Stafford stated that on July 15, 2003, the United States Court of Appeals for the Fifth Circuit, sitting in New Orleans, affirmed judgment in Harris Countys favor in Marilyn Murr Doyle v. Harris County. Dr. Doyle, a former Assistant Medical Examiner at the Harris County Medical Examiners Office, sued Harris County alleging that she was wrongfully discharged from employment in violation of the Texas Whistleblower Act and the First Amendment to the United States Constitution. At the conclusion of a fourteen-day july trial, the jury returned a $250,002 verdict against Harris County. Thereafter, Dr. Doyles attorneys sought recovery of more than $500,000 in attorneys fees and costs. Howdy, yall. I guess Im gonna have to sell my horses and tractors at the ol Rancho Pequito. Thats right. None other than the infamous, and incredibly humble Gene The Weenie Green, has declared me All Hat and no cattle. I probably ought to just shut up and listen to The Weenie since I have a real knack for creating facts when the truth doesnt meet with my skewed point of view. By the way Gene, I dont buy the space for my column, its provided by the paper. A few quick observations for our learned congressman. The only group trying to disenfranchise Texans is the Liberal Democrat Party. We, the people, are getting pretty fed up with that tired cliché. The term tyranny of the majority and the drivel following, seems fine as long as the majority is Republican. However, all those years when the majority was Liberal Democrats, it didnt apply. Something is wrong with that reasoning, congressman, but then you are now the oppressed, arent you? And there you go again! Telling us that those WEENIE democrats who skipped their responsibilities and ran to Oklahoma, stood against tyranny, and that is the definition of a hero. Boy, did you have to twist and turn to get that to work. I bet you look like a pretzel! Evidently, Hillary and Bill taught you quite well. We now have a new victim class in Texas: Democrat congressmen. Republicans, I know I would. I have never even talked to a Republican Party person, although I will be talking to your opponent next year, you can bank on that! The line from a movie fits you here, congressman, Be afraid. Be very, very afraid. Gene, I do not want anyone to think you are not a decent human being, because I think you may be. However, you have been around some pretty bad people in Washington Town and it seems to have rubbed off. Your politics are out of step with Texans, no matter how much you sound off about all your support of conservative issues for your district. The fact that you first notice a persons ethnic background, rather than they are Americans, shows that you are still a Liberal. Talk is cheap and irrelevant. If you truly believe you stand for conservative values, change your party affiliation. If you are just sayin the words, stay where you are. You are judged by the company you keep. As I told you once, already, you need to choose some new friends, Gene. Folks, you make the call. Youve heard, or read, both sides. I have no political agenda and I trust you, but since Im not runnin for office, I have nothin to loose. Gene does. Probably the best two things about The WEENIE readin and responding to my column is first, he does know how to read, and secondly, if hes readin Horsefeathers, he is takin time away from Washington, and therefore, stayin out of our business! Thanks, Gene. You all let me know if I outa sell Rancho Pequito. Ive had quite a few folks tell me, Git em, cowboy! I may have to put a guard at the gate to keep it closed, sos all of Lloyds Republicans wont overwhelm the place. I hope you all are enjoyin hearin from ol Gene The WEENIE. I know I sure am! HIGHLANDS– The Highlands Chamber of Commerce held their installation luncheon and Awards ceremony last Thursday noon, and ended up with a new president, a new board (partially), and 4 important Public Safety and Service Awards to essential members of the Community. Outgoing president Wanda Asbeck moderated the ceremonies, with the help of Lt. Jack Hagee of the Constables office, Judge Mike Parrott, and visiting Judge Reuben Guerrera. The new president sworn in was banker Charlie Farrar. Other officers included 1st VP Vern Miller, 2nd VP Kim Harrison, Secretary Nancy Simpson, and Treasurer Diane Lester. In addition to the installation, Awards were presented for community service. These included the top award, the Terry Davis Award, to Highlands/Bellaire firefighter Deacon Tittel. 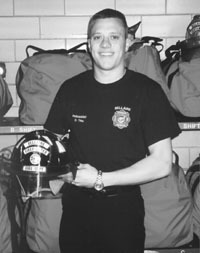 Deacon was cited for his service to two fire departments, his recognition as Firefighter of the Year by Bellaire and Harris County, and the offices and accomplishments he has held with the HVFD. He also has been active in community events such as the Sports Association, as a coach and board member. Public Service awards went to Reserve Deputy Constable Joe Avalos; Highlands Firefighter Sean Matula; Sheriffs Deputy Keith Thornton, presented by District II Captain Michael OBrien; and the Business of the Year to Bouquets by Mae owner Rebecca Harrington. Wanda Asbeck reminded the large crowd gathered for lunch that plans were underway for the annual Jamboree, scheduled for the first weekend in October. Board members installed included Al Pyle, Gary Anderson, Linda Palmer, Calvin Evans, Kim Harrison, Debbie Langham, Nancy Simpson, Jerry Ickes, Wanda Asbeck, Weston Cotten, Roy Elliott, Gil Hoffman, Angela Barron, Vern Miller, Dianne Lester, Doug Dodds, Michelle Bitterly, Jim Strouhal, Lynn Kemplay, Dickie Woods. The keynote address was presented by Judge Mike Parrott, speaking on Responsibility and the heroes of community service. Presenters of awards included Jerry Ickes, Lt. Jack Hagee, Fire Chief Harvey Little, and Capt. Michael OBrien of the Sheriffs office.